These 4-class short sessions are a great way to try out our classes and teaching style. 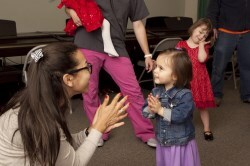 Students and parents share class time together to pick up the basics of solfege singing, rhythm activities, movement activities, and basic keyboard geography. We find students also benefit from the opportunity to adjust to a new learning environment. Intro classes are offered during the summer and between semesters for those wishing to join after the beginning of the regular semester and are helpful (but not required) before joining a full-length semester course. Click HERE to see more information.